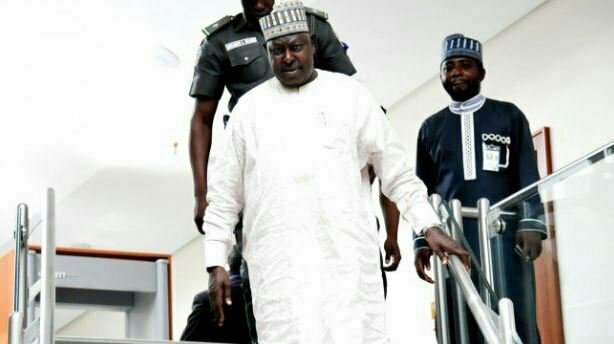 The Economic and Financial Crimes Commission (EFCC) has released Babachir Lawal, former secretary to the government of the federation (SGF). Lawal, who has been in EFCC custody since Wednesday, was released on bail on Friday evening. President Muhammadu Buhari sacked him after he was indicted for sharp practices in issues involving internally displaced persons in the north-east. He was accused of using his company Rholavision Engineering Ltd to corner a N200 million contract for the clearing of evasive plant species in Yobe. His arrest happened barely 24 hours after former President Olusegun Obasanjo wrote a strongly-worded letter to Buhari, accusing him of condoning corrupt practices among his allies. This prompted speculations that Lawal was detained because of Obasanjo’s letter. But the EFCC denied such claim, saying it had nothing to do with Obasanjo’s letter and that both incidents were coincidental. Sami Ammadin, acting spokesman of the commission, also said Lawal was assisting the commission in its investigation.